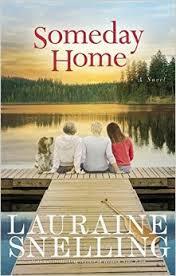 Someday Home has a rather unusual plot, although the theme of women’s friendship is a perennial favorite of readers. Lynn Lundberg has no real financial need to sell her sprawling house since her husband’s unexpected death a few years ago but she has often considered why she continues to stay. Yes, her family is very close by but her home is a lot of house for one person. When she hears of a new way of living where single women become housemates, she feels this may be the answer to her prayers. But where do you find these women and how do strangers become friends and live in harmony? How do you provide a space to live in, be restored, perhaps to grieve? Where these women can even become family and eventually call their dwelling, home. Fans of Lauraine Snelling will enjoy her easy reading storytelling and the many, many nuggets of spiritual truth evident throughout the book. Especially those grieving, whether it is death or the death of a dream, will find much to uphold and strengthen them. Ceil Carey is a retired public librarian but of course, once a librarian always a librarian so she can’t keep her fingers out of the library pie-she is on the public library board and will soon be starting a library in her church.